A good wander over to the farmers market yielded these tasty little gems called garlic scapes or garlic greens. These are basically the flower stem of a garlic bulb. They give you that garlic flavour without too much garlic bite. They have a really short season though so grab them when you can! They do freeze nicely though. 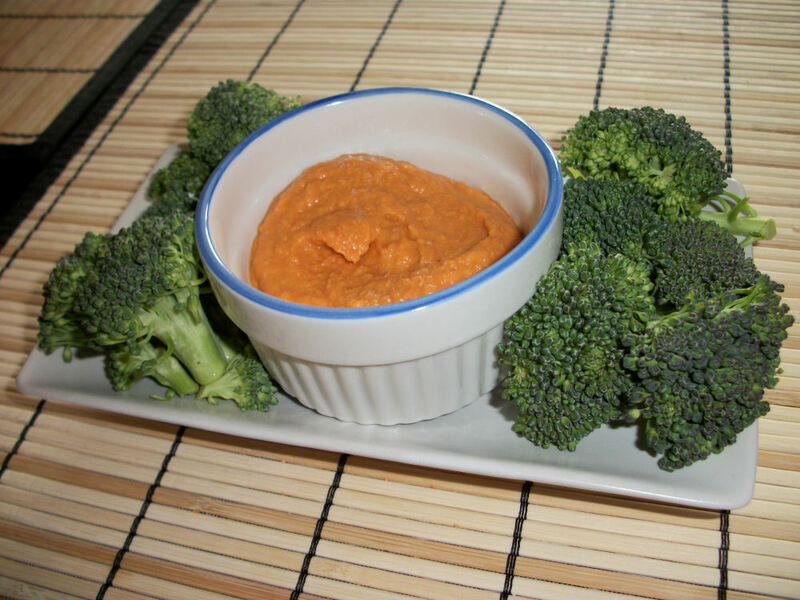 I love garlic dressings, my mom makes a Croatian salad that I just adore that has a lovely simple garlic dressing. In my opinion the bitier the better. 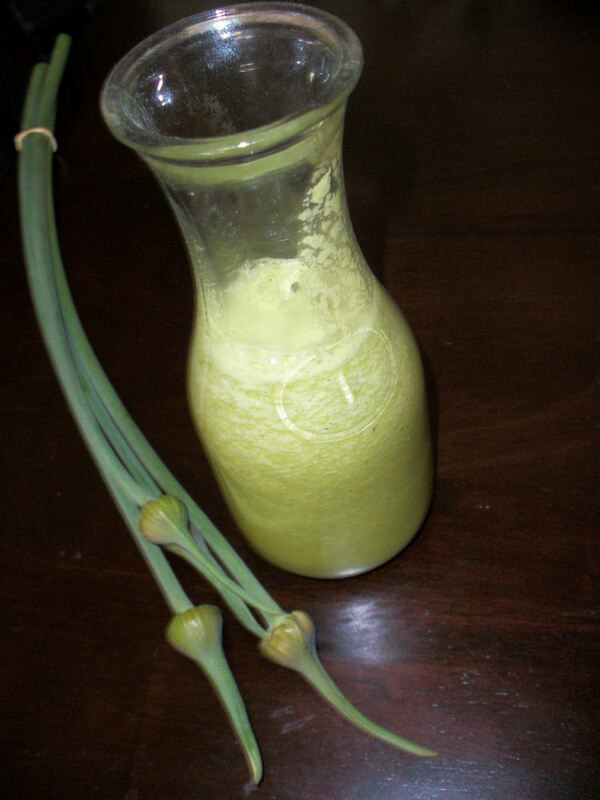 For those who want milder garlic joy though a garlic scape dressing would definitely be the way to go. Add the ingredients to a blend and blend until smooth. I love how simple salad dressing can be! Makes 8 servings (2 tbl each). 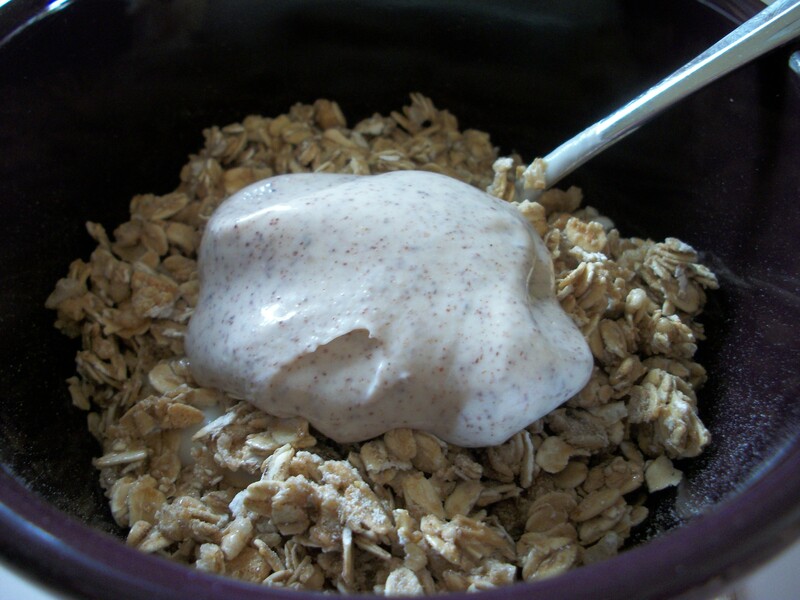 Each serving contains 19 calories, 1.1 gram fat, no fibre, no protein, 3 grams carbs. Aren’t those the best salad dressing nutritionals ever? It doesn’t take much to go far with this dressing. Now that salad season is upon us this is definitely the time to hit the farmer’s market and get those ingredients to start making your own dressings and salads! I’ve been waiting so long to do this one. When I first glanced at the recipe in LOTRO I knew exactly what I had to do for these eggs. I’ve been waiting for that perfect time of year to do this. 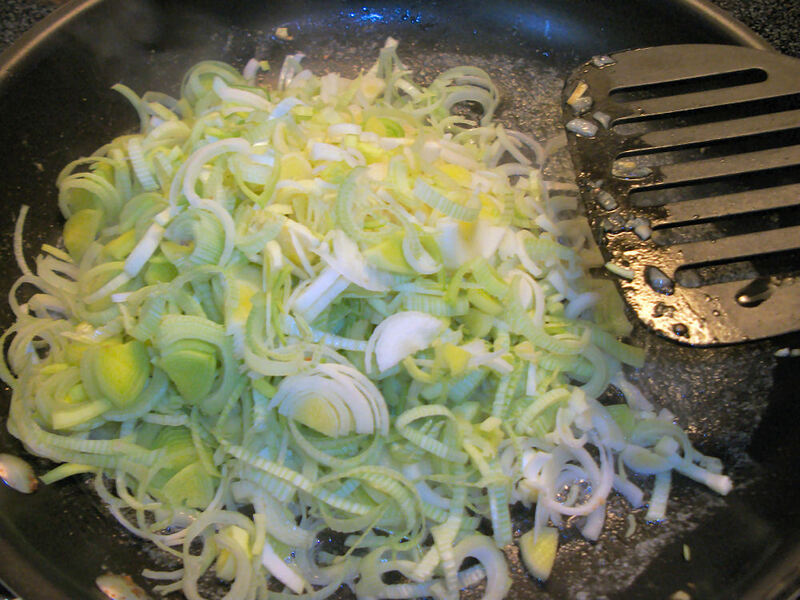 In the game these eggs are made with eggs and onions. They are described as “what seem to be normal hardboiled eggs are really Farmer Sandson’s famous recipe!”. 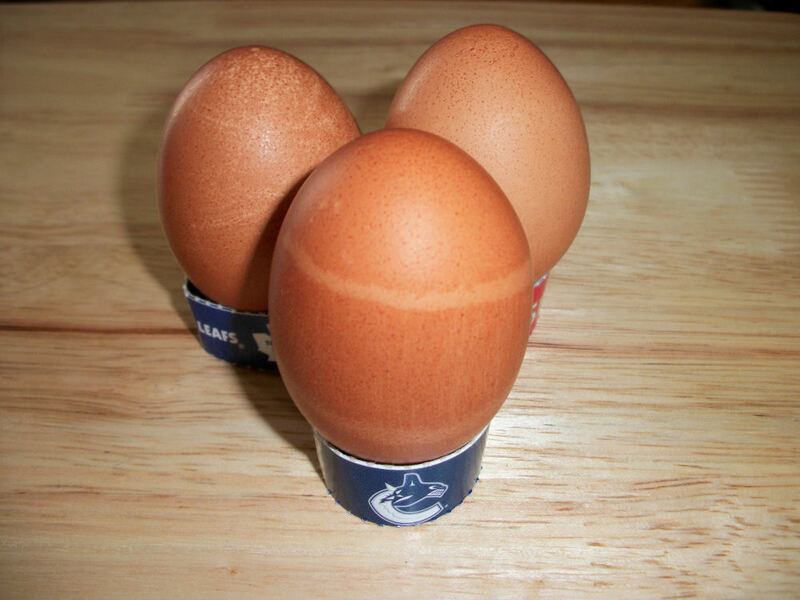 How do you make hardboiled eggs with onions, you may ask. Simple! We’ve been doing it in my family for years! Start saving your yellow onions skins! I think this method makes them taste better than your average hardboiled egg but then it could just be because they are pretty. Place the eggs in a medium saucepan. 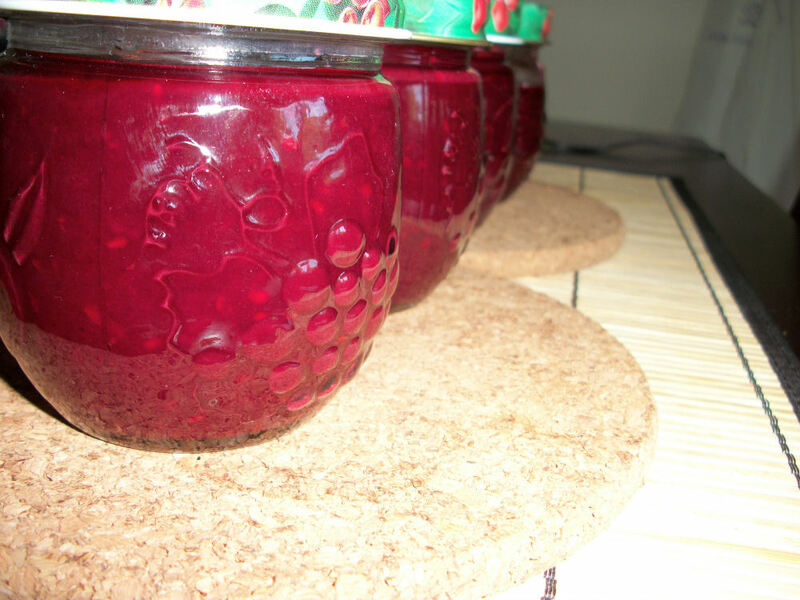 Fill with enough cold water to cover with an inch of water from the top of the highest egg. 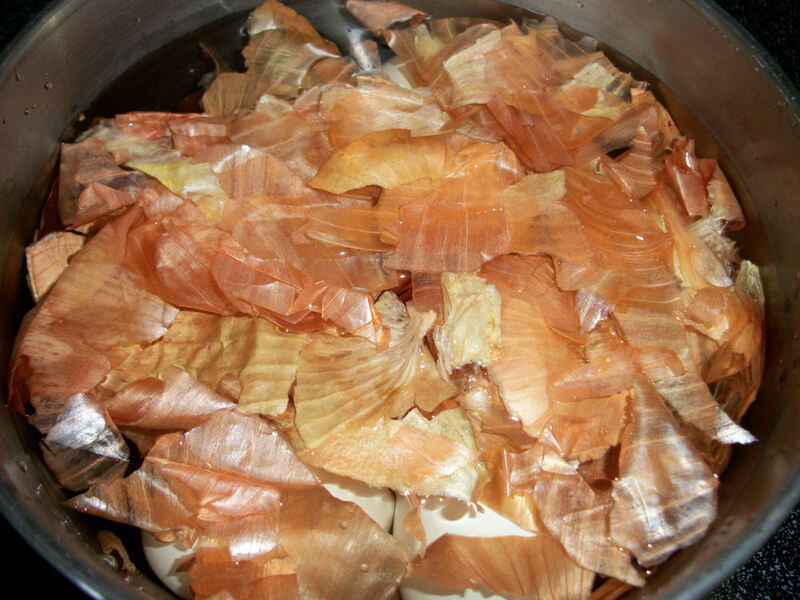 Add the onion skins to the pot covering the eggs. Bring the water to a rolling boil over high heat. 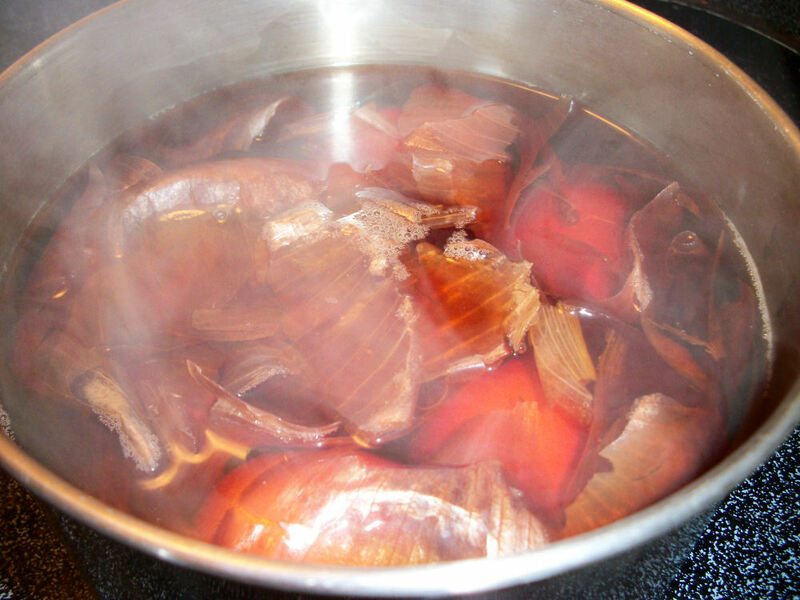 Once it begins to boil reduce the heat to medium and allow to cook for 10 minutes. The water will get beautiful and dark, that’s perfect. 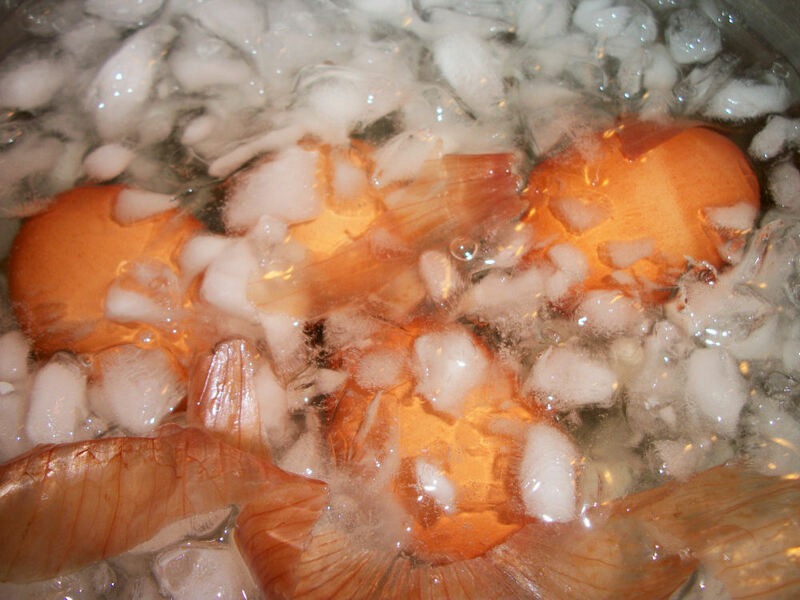 Remove from heat and immediately place the eggs into icy water to chill. This keeps those egg yolks pretty and yellow, instead of greenish. Chill for atleast 5 minutes. Longer is perfectly ok. 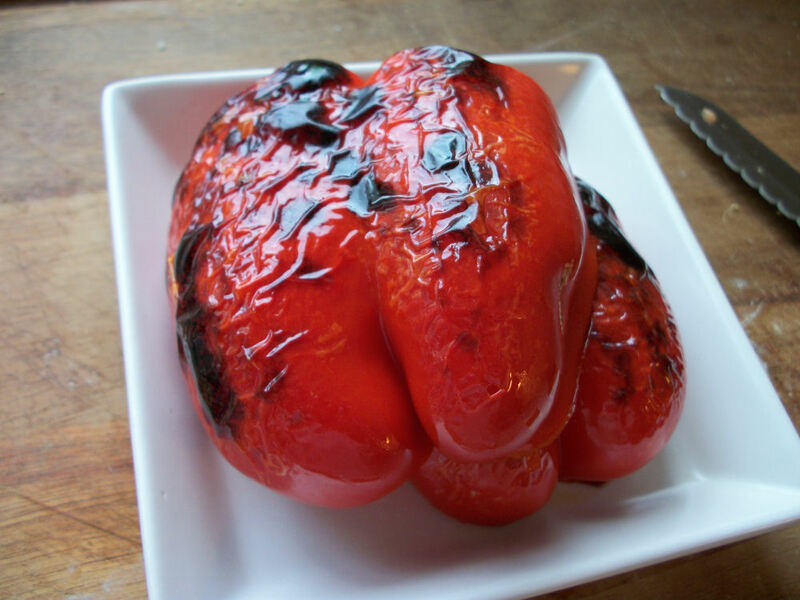 Remove from the icy water, rub dry with a towel and serve! Or keep in the fridge with the shells on for up to a week. Note: all the info I found for just one egg seems to vary. Check the package on your brand. For general info here is what I had: each egg contains 80 calories, 5 grams of fat, 0 carbs, 0 fibre, and 7 grams of protein. Also, I am not declaring for any particular sports team over there. I had them on hand and I live in Victoria, BC…I gotta put the Vancouver team up there lest I possibly face some sort of lynch mob or something. Hope you have as much fun making these as I do! BTW you can totally make more than four with the amount of dye those egg skins will give you. Just cool and start again. This sandwich is inspired by a delicious deli that is in downtown Victoria. Sam’s Deli does sandwiches so well, we make it a point to bring anyone who visits us over there for lunch atleast once. They have mastered the art and the portions are simply uber. Oh yes, they do right by the earl. My favourite sandwich is the shrimp and avocado. Oh such tastiness. Sadly, I don’t always find myself in that touristy part of downtown so I go without sandwich…that and I’m sure their uber sandwich portions are well…not so friendly for my weight loss attempts. While they just use straight avocado I decided to go with more of an avocado spread to help it last longer between sandwiches. The result was scrumptious. I also went with a Portuguese bun, sadly the whole wheat ones were sold out that day *shakes fist*. I was not to be denied sandwich on a technicality though. The beauty in this sandwich lies in its simplicity. It is…shrimp and avocado. Blend the avocado, lime juice and seas salt together until smooth. If you prefer chunky then just chop and toss a bit! 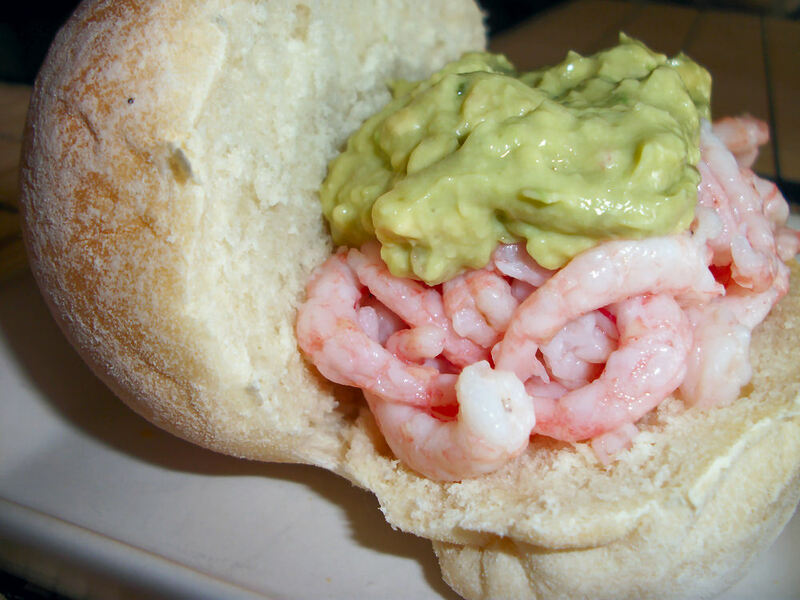 Pile the shrimp on the bread, top with 30 grams of avocado mixture. Top with ground pepper. Omnomnom! You see the simplicity? You typically get enough avocado spread for 4 more sandwiches. Each sandwich filling (shrimp and avocado mix) contains 134 calories, 7.3 grams of fat, 3 grams of fibre, 4.4 grams of carbs, and 13.4 grams of protein. Don’t worry about that fat too much. It’s the avocado and that is good for you. You do need so much fat in a day so you might as well make it a fat that is good for you!